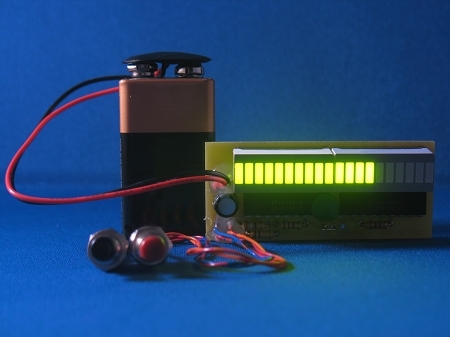 Working 20-LED sequencer designed for movie props. Originally designed at the request of professional movie and TV props makers. Similar to the power indicator seen on some of Star Trek Phaser Rifles and Type 2 Phasers (2364, 2366 and 2371). Also similar to the LED bar graph seen on the GhostBusters Proton Gun. SET and FIRE inputs. In a typical setup, the user would press the SET button and the power indicator would go up. Then the user would press the FIRE button and the display would go blank. Super bright green bar graph. Compact board, 2-7/16 x 1-1/16 inch or 61 x 27 mm. Simple push buttons switches included. Use as is or replace the push buttons by any other momentary type which will fit your prop.